[LIVE] Celebrate RuneScape Classic, 2001-2018. Double XP & big events! 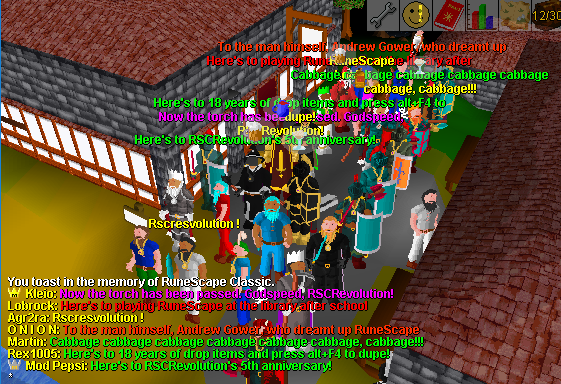 News [LIVE] Celebrate RuneScape Classic, 2001-2018. Double XP & big events! Only on the 6th, you will be able to use the ::toast command on each of your characters. 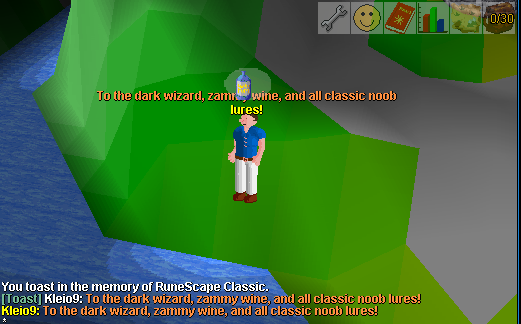 This will issue a random cheer to the server celebrating the community's memories from original RuneScape Classic. Your character will also appear to enjoy some random drink, represented by a bubble over your head. The ::toast command gives you one hour of doubled experience rates per character. So use that as a chance to get some casual training done in between this day's parties and events. You can also use ::toast2 for purely visual glory. We have added a new permanent game mode option when creating a character, this will join regular and ultimate ironman as an alternative way to play the game. Veteran mode pays respect to the ruthless limitations of original RuneScape Classic, so veteran players will have a measly 1x experience rates, and restricted features such as no batching and no access to teams or the party system. A discontinued item known as the Disk of Returning will be given as a potential prize for events throughout this day. Not so coincidentally, a retired dwarf named Thordur has returned to the dwarven mines below Falador. He no longer sells disks, but if you get one and show it off to him, maybe he'll at least tell you about the old days. Could the legend of the old void jail known as the black hole be real? No one has seen it in over 15 years! In the time before its closing, our staff dumped objects and dialogue from RSClassic as well as other data so that we can be sure to preserve the differences and replications in its absence. Aside from minor object placement changes, gnomeball and gnome food tasks going live in a later update will be the most notable things added from this final dump. Bank space has been increased from 384 to a maximum of 500 slots, this seemed reasonable due to the variety of new items added to the game through regular updates. 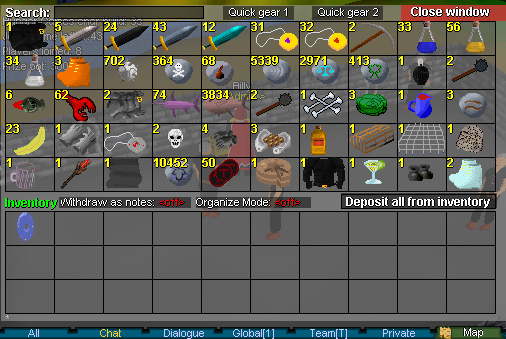 Deadman Season Two will start soon after the end of the event for in-game and real-life cash prizes. Deadman is a thrilling f2p tournament incorporating PvP fighting and skilling, so get hyped! We want to thank you for joining us in our celebration of RuneScape, whether you're a new player or a veteran of the server. RSC will last forever through this community's dedication, and that's all thanks to you. Awesome stuff Billy. Long Live RSC! Challenge 30: A pistols only King of the Hill game against the elite opposition. A good way to find out how many times you can die in 10 minutes. Where can you try out vet mode? 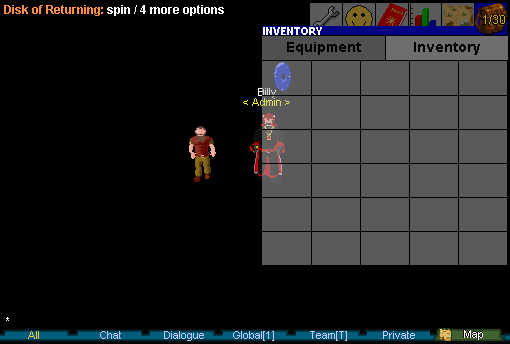 I tried to make a new char and see if theres anything on tutorial island but the client froze and is still frozen. RIP RSC so many fun memories Long Live RSCR! Can't wait for the celebration to begin! RIP Jagex RSC... here's to the continued success of RSCR! Went to get on my old classic account only to find it was permenently banned in May for breaking in game rules. Must have been someone else on my account cause I haven’t been on it over a year. Pretty bummed to not be able to get on one last time. can veteran's account use subs? that would defeat the whole point of this account! Good question. For veteran characters subs only affect global message and afk logout timers. We were considering making vet mode limited to f2p unless subscribed, echoing the classic membership, but ultimately decided against that. So how many times can you use ::toast? Hi, you can only use ::toast once per character on this occasion. We only wanted to give a little surprise double XP today, not force a big grind. We give a bigger heads up in the case of a substantial double XP event so everyone can prepare accordingly. Also note that veteran mode characters will toast visually, but their XP rates will not change.